Pregnancy is a very transitional time for a woman. Not only are you preparing for a baby to be welcomed, your body is making preparations as well. It is typical for an expectant mother to gain a few extra pounds while growing and nurturing a baby over the course of nine months. Once the baby arrives, many mothers are soon looking to soon lose weight after pregnancy is over. The following are healthy tips and tricks that will be able to help you get on track to reaching your weight loss goals after giving birth. Breastfeeding not only nourishes your newborn, but will also help you to burn away calories and tighten your stretched uterus. Nursing your baby will help you burn anywhere from an additional 300-500 calories per day! The hormones that are released help to tighten your uterus, which helps to shrink your belly. Nutrition is an important part of shedding unwanted weight. It is important to not put yourself on a “diet,” but rather keep yourself eating small, well-balanced meals throughout the day. The foods you eat should be packed with the proper nutrients that your body needs. If you are still breastfeeding, it is recommended to keep your calories at a minimum of 1,800. In order to lose weight through nutrition, you will need to have a calorie deficit, meaning that you burn more calories in a day than you consume. A nutritionist or a doctor could help design a meal plan for your needs. While nutrition can help you to shed those unwanted pounds, starting an exercise program can help you to tone and shape your body as well. Exercise can help you to burn fat, build muscle and help keep your body strong. Being a new mommy, it is understandable if you do not have time to join a gym and that’s okay. 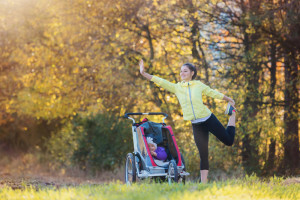 There is plenty that you can do with your little one and still stay fit. Take your baby for a walk in the stroller or join a “Mommy and Me” class at your local gym. In addition to the physical benefits, exercise can also help battle depression, relieve stress and help with sleep issues. New mothers are often exhausted, and understandably so! It may be hard to find the motivation to stay on track with your weight loss goals after the pregnancy is over. Find a friend to team up with, or join a group that will help to keep you motivated and working towards your goal. It is also important to stay positive through your weight loss journey. It may take some time to fit back into your pre-pregnancy jeans, but be proud of the accomplishments you make along the way. Before starting any plan, check with your healthcare professional first. It is important that your body has enough time to rest and heal from giving birth before you start any weight loss plans. Previous Post: « Antidepressants During Pregnancy: Are They Safe?